Rochester Institute of Technology (RIT) offers 70 graduate programs in a combination of high-demand fields such as science, engineering, technology, business, and mathematics as well as award-winning imaging and fine arts disciplines. 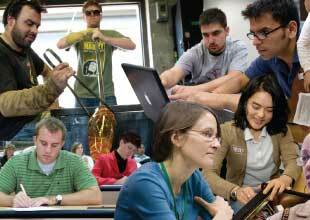 Geographic Diversity: Enrolled students represent all 50 states and more than 100 countries. Financial aid: Financial aid and scholarships are awarded on the basis of demonstrated financial need and academic merit. Rochester Institute of Technology (RIT) offers 100 graduateprograms in a combination of high-demand fields such as science, engineering, technology, business, and mathematics as well as award-winning imaging and fine arts disciplines. Founded in 1829, RIT is an internationally recognized leader in professional and career-oriented education. The graduate student population is approximately 3,250 students. RIT’s US campus is a modern 1,300-acre campus located in Rochester, New York. RIT also has campuses in Croatia, Kosovo, and Dubai. RIT is now among the top third of US “National Universities” in the 2019 U.S. News & World Report rankings. The University was included on the magazine’s lists for “A Focus on Student Success” and “Great Schools, Great Prices.” RIT is also included in ThePrinceton Review’s 2019 edition of The Best 384 Colleges as well as in its 2017 edition of Colleges That Create Futures: 50 Schools That Launch Careers by Going Beyond the Classroom. Excelling in research and teaching, our faculty are passionate about their disciplines and their roles in both the lab and classroom. They are innovative and resourceful. Most are highly published, are internationally respected in their fields, and have terminal degrees. They want to teach and engage students in the process of discovery and the contribution of new knowledge to their fields. RIT has a sophisticated, high-tech campus, investing more than $300 million in the renovation and construction of academic and student-life facilities. The Princeton Review consistently ranks RIT among the most connected campuses in the country. There is free, direct, high-speed computing access throughout campus. RIT has 50 research centers supporting applied research, consulting, and innovation. Through the administration of scholarship, fellowship, and research funds, RIT offers graduate students high-level participation in research. Students participate in approximately 250 active clubs, 11 major student organizations, and 30 Greek organizations on campus. RIT’s athletics program boasts 24 men’s and women’s varsity sports. Most competitive athletic teams are NCAA Division III, except for men’s and women’s hockey, which are Division I. The placement rate for the entire RIT graduate student Class of 2017 was 97.2%. RIT has established more than 3,000 corporate and government partnerships. Hundreds of top companies come to campus each year to recruit our graduate students, who have strong employment prospects because of our programs’ career focus. RIT’s twice-yearly career fairs draw more than 400 employers from across the United States and abroad. RIT is chartered by the legislature of the state of New York and accredited by the Middle States Association of Colleges and Schools. In addition, individual colleges have professional accreditation for specific programs. All applicants must hold a baccalaureate degree from an accredited institution and have a cumulative undergraduate GPA of approximately 3.0 or better. International applicants whosenative language is not English must submit English test scores. Some programs require a GMAT or GRE test score. MFA programs require portfolios. Consult rit.edu/grad for details.